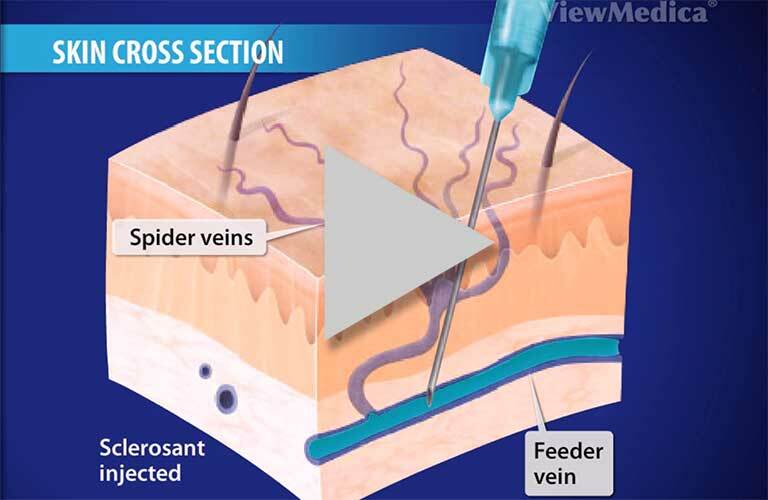 Vein Nevada provides individualized and comprehensive vein care for vascular conditions and diseases. We give you the best in comprehensive care, diagnostics and minimally invasive treatments to maintain and restore your health. 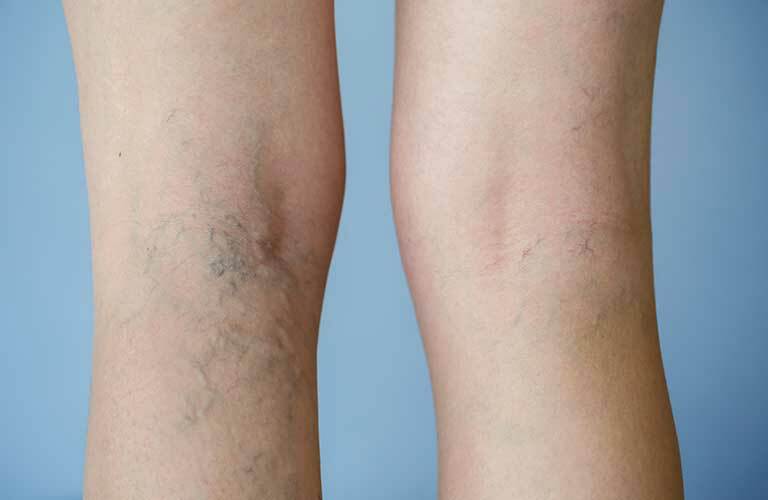 More than 30 million Americans suffer from varicose veins and the more serious form of venous disease called Chronic Venous Insufficiency (CVI), yet only 1.9 million seek treatment each year. 1,2,3 If the disease is left untreated, varicose veins can progress to become CVI with symptoms that worsen over time. Fortunately, diagnosing and treating this disease early can halt its progression. Does sitting too much cause varicose veins or related symptoms such as swollen legs or leg cramps? There's a good chance you're sitting while reading this article. We sit while driving the kids to school and while driving to work. Many of us sit at a desk all day at the office. We do it all over again at the end of the day, when we commute to pick up the kids at school and drive home. Then we sit on the couch for a couple hours watching TV before bedtime. 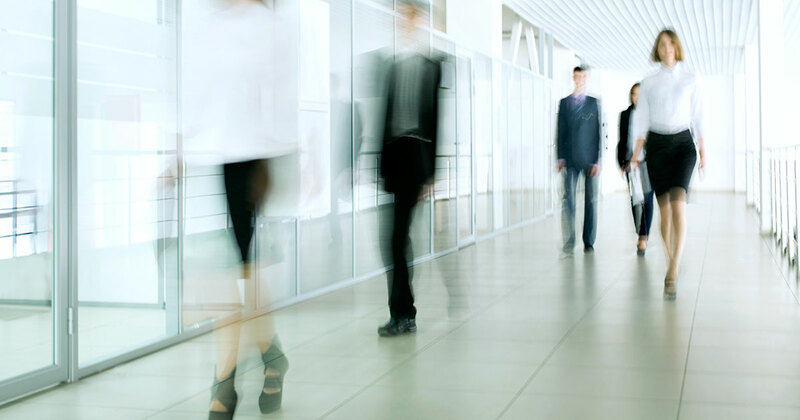 What may be surprising to many people is that sitting all day is harmful to their health. It has even been compared to smoking. 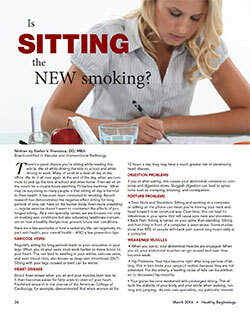 Recent research has demonstrated the negative effect sitting for long periods of time can have on the human body. Even more unsettling, regular exercise doesn't seem to counteract the effects of prolonged sitting. As a vein specialty center, we are focused not only on treating vein conditions but also educating healthcare consumers on how a healthy lifestyle may prevent future vein conditions. Here are a few examples of how a sedentary life can negatively impact vein health, your overall health, AND a few prevention tips. Read complete article here. How do you treat leg cramping and swollen legs? 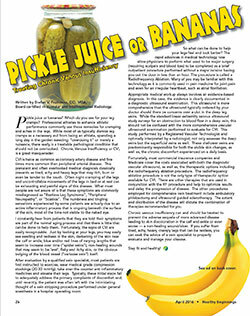 Pickle juice or bananas? Which do you use for your leg cramps? These remedies for cramping and aches in the legs are commonly used by professional athletes to enhance athletic performance. While most of us typically dismiss leg cramps as a necessary evil from being an athlete, spending a long day in the garden weeding, "overdoing it" or merely a nuisance, there really is a treatable pathological condition that should not be overlooked. Chronic Venous Insufficiency or CVI, is a great masquerader. Read more here.